Today, I complete the journey of carpeting the trunk of the MG (Oliver). In my last post on this topic, I had papered the trunk to create templates. I drew lines with a thick marker to help identify the cut lines and then cut along those lines with a razor blade to create rough templates. I was able to collapse the rough templates for the wheel arches as well as the inner sides (referring to that area as the hip-walls) into a single reversable template for each. I cut the little dome into its own template as well as the little shelf into one. This left the rear firewall and main floor as the final templates. The trunk, obviously, isn't flat. The wheel arches, for example are roundy, so once the paper molds came out, I needed to plan for making that 3 dimensional object flat. This meant careful cutting, removing v-shaped wedges from the outside pointing toward the axle so the paper (and eventually carpet) could curve when pulled back together. Since I had used small pieces of paper, I was able to leverage the seams as visual cues to what could naturally be formed. Ultimately, the wheel arches and the little dome were the only hard-to-flatten pieces. Since I had drawn the cuts along natural transition points, most of the templates fell flat without modifications. I decided to leave the main floor carpet until all of the rest of the carpet bits were completed. I know the main floor will require some different treatment, so I'll get to that at the end, or another post. As a means of validating the templates, I traced each onto some of the U-Haul packing foam sheets I had used as a carpet backer for some of the carpet in the cabin. The sheets are super inexpensive, but if the templates applied well, I could use the foam both as a cleaner template for the carpet as well as a backing for it. Before I started tracing, though, I considered the points where the carpets would intersect and planned for overlapping tabs. This would prevent any gaps from appearing between the sections. For there, I simply added some blue tape along the side where an overlap would be and then taped sticky-to-sticky on the other side. This added about 1/2 an inch along those edges. Once the overlaps were accounted for, I laid them out on the kitchen table and one by one traced with a marker. I needed to clean up a line here or there with a straight-edge, but generally I just traced and cut along the lines. As I completed each cut, I test fit the foam piece into place. Over the course of a weekend afternoon, I was able to form and test fit all of the foam pieces, including the rear firewall. The paper'd in rear firewall was unwilling to work well, though. So, I took the old panel from inside the cabin and traced that instead, figuring I could trim if I needed to. The foam fit perfectly, though. When I think about it, that makes some sense: it is the exact same pattern, just a tiny fraction of an inch more rearward. It should have worked. Finally, the big fun could begin. I started with the 2 foam pieces for the wheel arches. I had planned the overlap tabs so I could work from the outside, in, and the wheel arches were the furthest out. The process was simple. First, trace the foam edge onto some carpet with a pastel (I decided that pastel made less dust-mess than chalk would have). Cut along the lines, glue the pieces together and then glue them into the car. That took less than 10 seconds to type and a sporadic weekend to do. Okay, it was really only a few hours, but dedicating that much time in one chunk can be difficult sometimes. So, it was wheel arches, then the side wall / rear side decks followed by the small shelf and little dome with the rear firewall last.In each case, there were overlap tabs from the prior section into the current section so no trunk paint showed through. I used spray adhesive to get the foam and carpet to mate. I sprayed onto the foam, and then aligned one edge, lightly flopped the carpet onto the foam and then pressed firmly from the center to the edges. Once all of the foam-to-carpet bits were done, I cleaned the trunk with tacky paper cleaners that sell in a little plastic tube. Once clean, I considered that there were bits of trunk that were not going to be carpeted, but were not the right shade of orange, as painted by the prior owner. As I mentioned in another post, the Ace-brand rattle-can orange paint actually matches really closely, so I covered up the car with tarps and shot the inside of the rear quarter panels and the outer edge of he wheel arch. The paint dried quickly enough that I was able to continue the carpet steps later that afternoon. 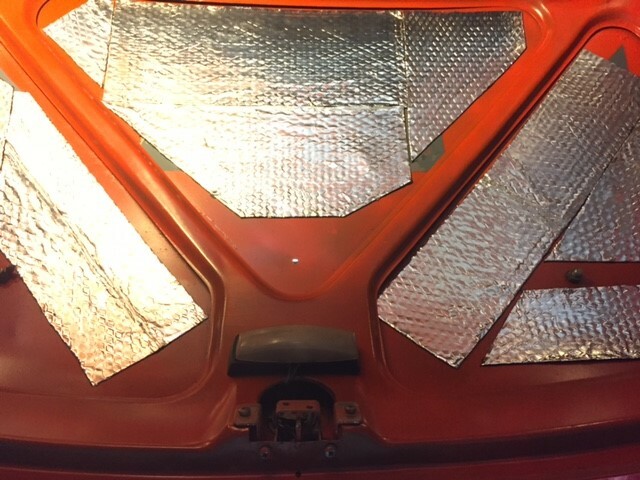 To apply the foam/carpet to the trunk, I used brush-on contact adhesive. This is the same nasty smelling stuff I used to adhere the carpet to the speaker box. I simply brushed on a thin, but cohesive layer at one end, and applied the carpet as I went. This allowed me to make small adjustments as I went. This was especially important for the hip wall and fire wall carpet sections. All of the story above applied for the carpet everywhere except on the floor of the trunk. I wanted to be able to remove that carpet section so I could clean or get to the fasteners for the fuel tank. So, while I was at Home Despot getting the brush-on contact adhesive, I picked up the end of the roll of rubber sheet. 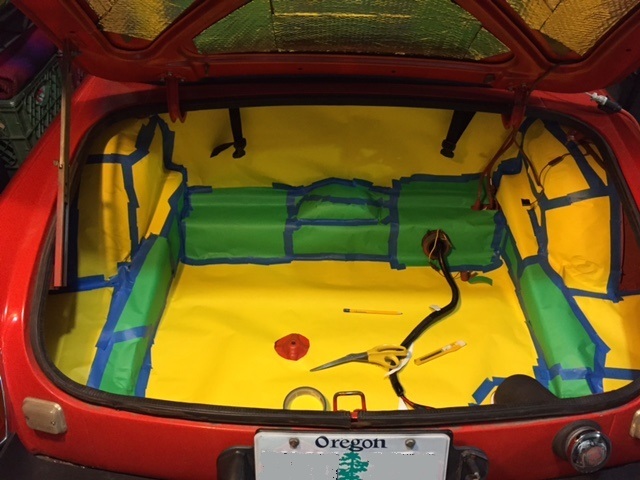 Being rubber, it will help keep the carpet dry if water gets into the trunk. It is only a few mils thick, but it worked perfectly as a carpet underlayment. I used the paper as a guide to start with, cutting the rubber sheet wider than the template at first. I test fit, trimmed with a straight edge and repeated that process until the rubber sheet fit perfectly. To cut the holes for the spare tire mount, the fuel tank filler and filler vent I traced a small paint can (for the first 2) and a quarter with a razor-knife. Once the rubber mat was set, I transferred the pattern onto the carpet. I found that the carpet did not want to move around once it was on top of the rubber so I didn't bother to adhere them together. For now, the carpet just sits on the rubber mat. So, that's it. Like so many of these projects, I spent much more time than I intended. It looks really good now, though. I re-installed the speaker box and it all looks like it was made to go together. I just have the trunk lid to resolve and the trunk is complete. I suppose I should find an old Honda donut spare so I have one that fits. As always, thanks for following along. With the approaching nice weather, I think I will be shifting my attention back to the bus, and leaving the MGB in this state so we can drive it this Summer. Maybe I'll get to the interior next winter. When I did the speaker box, I bought 2 4-foot by 6-foot rectangles of relatively inexpensive carpet designed for carpeting a trunk. With the speaker box completed (See Car that Goes Boom 1 and 2), I had most of the carpet left. So, I figured I would use it for it's originally intended purpose. Today's post covers the fun of forming templates. For those of you in the US, hapy day-after-tax-day. If your 2018 taxes were anything like mine, you are also wondering where that rumored tax cut went. I can't believe how much higher my tax burden was this year. Thanks for nothing mr trump. Anyway, back to carpet templating. When I did the speaker box, I used a roll of yellow poster paper to construct a template. I carefully covered the 5 sides, trimming and fitting around the various weird shaping I did to make it fit into the trunk on that little shelf. Once fit, I carefully cut the paper off of the box with a razor-blade. I transferred the template onto the carpet, cut it out and it fit just as I'd planned. It worked so well for the positive 3-dimensional object, I wondered if it would work for a negative 3-dimensional object... and a larger one at that. I started with the firewall. The old interior had a black cardboardy cover that was wrapped with vinyl. I figured it was a fair approximation so I traced it onto some of that yellow paper and cut it out. It fit fairly well, only it was wider, which makes sense. The cockpit is wider than the trunk. So, I cut one end off and I was able to get it to fit. I made up the difference with more paper and then moved to the wheel arches, papering and attaching with blue painters tape. I did small sections so I didn't have to wrinkle the paper, rather, I cut so the template would be more accurate. I decided to stop at the weld seam that runs up the center of the wheel arches, knowing that I could attach carpet scraps on the other side of the seam if I wanted to. Once the arch reached the rear floors, though, I extended the template all the way to the rear quarter panels. I thought it would have a more finished look with carpet there, even if the tire jack or a toolbox sat on top of it. Last, I addressed the little shelf, the side hip bits and the central floor. I made cut-outs for the various things that stuck out, like the little cap where the speaker cable came through, the wiring harnesses, the spare tire mount, the fuel tank vents and filler. When I was done, I had a bright yellow and green trunk (I ran out of yellow so I switched to green) looking like it was some kind of homage to the University of Oregon. Then came the fun part: deciding how I would section out the carpet so it could be installed, but also so a section of the main floor could be removed for easy cleaning. I decided to use the inner edges of the wheel arches as one dividing line. Then, the little hip wall along the edges extended all the way back to the rear made the next section. I also marked around the little shelf and the rectangle that run over the little dome and then around the rear firewall. The rest, from the bottom of the shelf back was one large section, so it could come out as one piece. The other pieces were going to be glued down, so they need to fit well and not have obvious seams. Since the trunk is symmetrical, I had matching pieces for the 2 sides (wheel arch and hip-wall). From these 2 cut pieces, I was able to make one good, reversible template. The dome and shelf carpets were solid templates as well. The large main section needed some tailoring, though, so it would have a nice rounded edge at the rear. I left off the sound system with some test fires and some lingering to-do's. Today's post covers the completion of those steps. 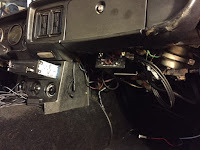 The first and easiest to-do was replacing the RCA cables from the head unit to the amp. I originally used cables that were thick and over a meter long (about 4 feet total length). With the head and amp so close together, this left me with lots of extra cable looped all around. I found a vendor on eBarf and had 18" cables delivered. These were perfect, leaving me enough extra cable to maneuver things, but without a bunch of extra to deal with. When I first put things together, I didn't have a ring terminal for the ground wire. We were in the middle of a late-winter snowstorm, so getting to the corner hardware store was not in the cards. I didn't want to stop my efforts so I slapped together a ground using a washer and some electrical tape. It did the job, and once he weather improved, trading this hack-job for a real ring terminal was easier than trading out the RCA cables. With those two things done, the front end of the system was complete. I had a couple of nagging issues in the trunk to deal with, though. 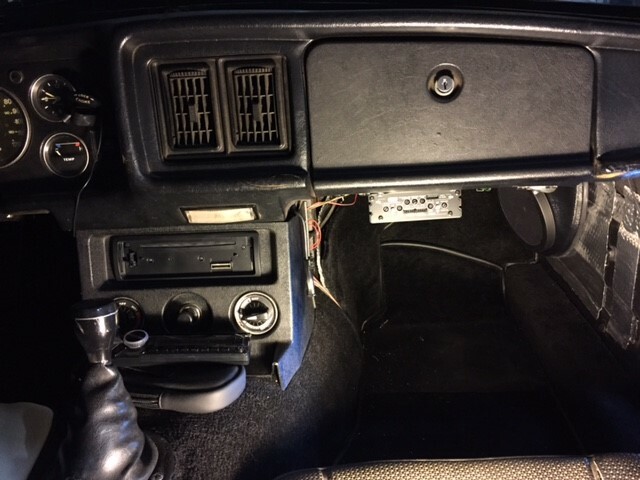 Back in the boot, I had the speakerbox fit onto the little (less than 4 inches deep) shelf, and against the lots-of-holes-in-it rear fire wall. The speaker was propped up by an old sub woofer that I wasn't going to use. It served the purpose of showing how the speaker would sit, but that wasn't a viable long-term solution. What it revealed was that the trunk light, which sits in the center of the trunk opening furthest forward, would be mostly blocked by the box. It lit up the top of the box beautifully, but the trunk was now mostly dark. So, I moved it. 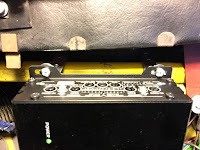 The trunk light housing is held to the "beam" that runs over the top of the little shelf by 2 Phillips head screws (picture at right). 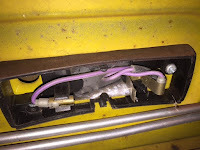 With these removed, and the purple-circuit fuse pulled, the housing can be lowered. I set the bulb aside and pulled out the feeder-wires from the housing. Those wires were then back-fed through the openings in the body until they were hanging loose by the right-side hinge where the switch is. I cut the 2 wires around the midway point, and then started experimenting with new locations. I decided to mount it to the underside of the trunk lid, just aft of the mount-points for the MG medallion which sits on the trunk top side. There is a cross-member here which provided a place to put the screws through without creating through-holes. I sent the wires from the housing through the trunk-lid cavity, and found I needed about a foot of wire to re-connect it to the switch. A few minutes of scrounging, cutting, wiring and taping later and the circuit was reconnected. I stuffed the wires into the trunk lid cavity and cable-tied the wire bundle closest to the hinge to the hinge so they wouldn't get hung up on future parcels in the trunk. I replaced the bulb, put the plastic cover on and replaced the purple circuit fuse. Tada! Light fills the trunk better than it did before and the light itself is not in your eyes anymore. 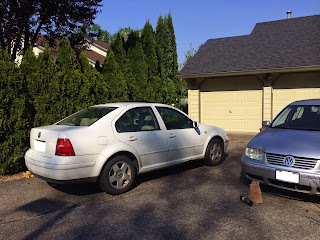 I will need to take care with objects shifting in the trunk, though, since the housing is now down near the latch. With the light solved, I needed to create a means of attaching the speakerbox to the car. I want the box to be easily removable, in case we want good sounds at picnics, or if I ever want to use it in Hapy. I also wanted to minimize ant further impact into the storage space in the trunk. So, adding to the little shelf or adding drop-feet to the box were not options. Instead, I thought through options to hold the rear top edge up and forward rather than extra support from below. I got a spool of 1" nylon strapping. These are used on backpack shoulder straps or gym bags and are super strong. I cut 2 1-foot lengths, and looped one end of each around the tank vent / hinge-springs that run the width of the trunk opening at the front edge. These looped from above, with about 1" of overhang below. I super-glued the edge of the 1" overhang to the longer side, and tested by pulling on them. To these straps, I threaded on the female side of a nylon strap buckle. Now, I had something to attach to in the car, the speakerbox needed something too. I bought some footman loops for the box-end. I put one footman loop on each end of the rear side of the box, 1.25 inches from the top and 2 inches from the edge. I repeated the nylon strapping process I did in the trunk with the overhang hidden against the box. I threaded the male end of the strap buckle onto these. After a little wrestling and fiddling, the box sets and is free-standing-ish. To install the box, I put the bottom front edge on the little shelf and then lift the box upright while holding the car-side straps to the sides. Once the box is upright, I click the buckles together. There are always little things that could be changed or improved, but I think, for now, the work is pretty much done. 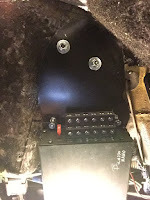 I changed the way the wires connect through to the speaker for greater ease of install, for example, by adding in RCA connectors between the speaker and the speaker wires. That hardly warranted a post, but it was completed once the parts arrived. We had a taste of spring with sunny skies and temps in the upper 60F's (about 20C) so Boo and I took Oliver out for a quick spin. I had installed the passenger seat (not post-worthy, it was a basic install with no discoveries nor bungles), so we were ready. Boo hadn't been on a ride except for a short drive down the street and back last summer so we were way overdue. I dropped the top, and pulled into the drive where Boo hopped in. We drove around the local neighborhood and easily chatted over the slight wind noise. We tested the sound too, and while it doesn't sound as good when it is sitting still in the garage, it sounds way better than I expected. The bass is full, the highs are present and the mid's cut through. Yes, there is wind shear, and some of the signal is lost, but most of that loss is filled back in when the volume is turned up. Boo and I agreed that the new seats are super comfortable, and the car would be perfect for a road trip. We just need a reason and a destination. Brief post today about an electrical breakdown deja vu but this time it's Oliver ('78 MGB), not Hapy ('72 VW). 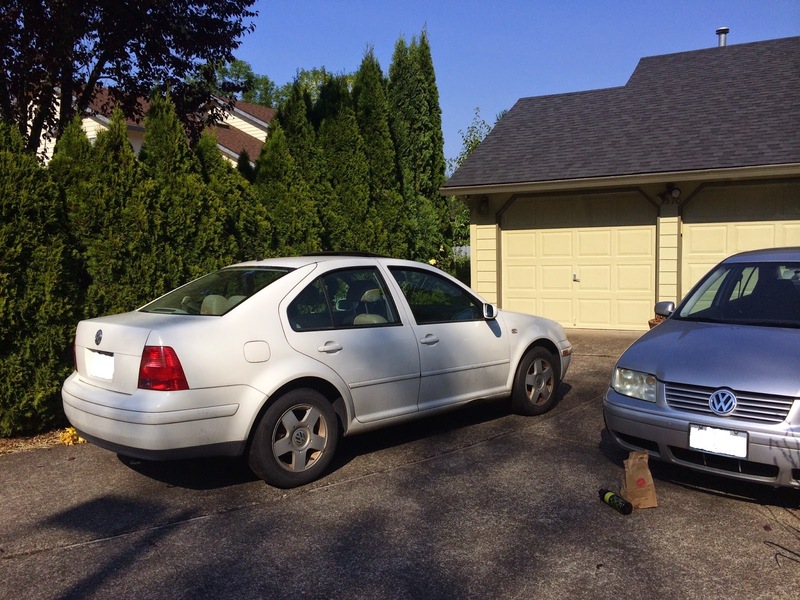 Most cars have a relatively simple "primary" electrical system. There's the battery which holds lots of stored power for starting the engine and regulating the secondary power usage. That part is obvious. Wired into that battery are the starter and the alternator (or generator in older cars). These are motors for opposite functions. One, the starter, eats the most power while the other generates power. Connecting these together are wires and the ignition switch. Seriously, that's pretty much it for the charging system. There could be a voltage regulator (VR) between the alternator and the battery, but oftentimes these are integrated into the alternator so you don't need to worry about them independently. The VR is separate on the original '72 bus, mounted on the right side of the firewall in the engine compartment. There are lots of other things connected into the electrical system, of course, but for today I'm focusing on getting the the battery to charge. And We're Talking about this Why? Back when I had the MGB looked at by the local British car experts, they indicated that the charging system was sickly. I swapped out the battery. I still found myself charging the battery up an awful lot so I bought and installed an alternator upgrade (now at 105 amps). Neat. You can find them here. But the little car still died on the side of the road a couple of weeks ago, with an electrical failure. After our adventure coming home from Furthur in 2013 (See Tale of Two Trips) I knew what an electrical failure looked like. Lights dim, wipers slow down, fans slow down and then the engine starts to miss. Soon, it won't keep running and you're gliding to a stop on the shoulder. If there is one. The last tip: the hazard lights don't work. Which is especially great when you break down in an exit lane where there is no shoulder / break down lane. Like here: (45°28'37.3"N 122°47'25.8"W). Fortunately, it was mid-afternoon on a Friday, so the traffic wasn't too bad. I got AAA on the phone and stood behind the little orange car in the sprinkling rain waving cars around me. While waiting for the truck, an ambulance pulled up behind me. One of the guys helped me push the car some of the way up the ramp. At the intersection, a couple of guys hopped out of a car and helped push the rest of the way up the ramp and around the corner to where I could turn onto Allen Blvd and coast downhill. I came to a stop around the corner on King and Lee where Oliver was loaded onto a flatbed. In my list of items included in the charging system, I failed to mention one last thing: the charging system failure light (labelled "Ignition"). This seemingly innocuous light bulb does more than just tell you when your charging system is fried. Of course, it does that and it is able to do that because of this other purpose. It provides a light 12v current to the alternator through a means other than the thick battery-direct cable. When that 12v meets another 12v coming from the alternator, no light. When the 12v meets ground, the light illuminates. Cool. This small 12v signal also initializes the magnetic field in the alternator so it can generate electricity. Without this little signal, there is no field, so no power generation, eventual system failure while you're trying to exit OR217. Neat. So, at some point after learning that my charging system was sickly, that little bulb died. Did I need a new battery? Maybe, the old one wasn't too old, but it was a discount brand. Did I need a new alternator? Probably, it was original and had the rust on it to prove it. Besides, 105 amps is far better than the 43 amps you get from the original or direct replacements. So, how do we prove this? Well, first, when you turn the ignition switch to run, you should see that little light. No light? Check the bulb. Assuming you missed that, or just want more proof, start your engine anyway and check the voltage at the battery while running the engine above 2000 rpm. If you're not seeing around 14v, you're not charging. Replacing the bulb is inexpensive ($2.50US per bulb at NAPA), though hard to get to. I was able to access it from under the left side of the dash by running my left hand up along the steering shaft, behind the tachometer. The bulb and harness are pressed into the plastic holder, and held in simply by friction. A slight tug on the harness will free it. The wires are kind of short, so getting the bulb down low enough under the dash so you can see and replace may be the hardest part. Well, that and getting the bulb and harness pressed back into place. Since I was up in there, I checked all of the bulbs, one at a time, to make sure I didn't have to get back up under there again any time soon. Fortunately, there was only the one. Even if the "Ignition" bulb weren't critical to getting a charge, it is wise to run with all of your warning lights working. Gauges are great, but when you're enjoying the scenery or enduring bumper-to-bumper rubber-banding traffic, you may not note your gauges as often. A bright red light on your dash attracts the eye. And, in my case, I don't have a battery / charging gauge to tell me how well my electrical system is. I like the stock look, so I doubt I'll change that, but if I wasn't thinking about it before, I kind of am now. Anyway, that's it for today. Thanks, as always, for following along. Continuing the fun from the last post about the amplifier install into Oliver. When we left off, we had selected an amplifier and an install location. I had concocted and fabricated brackets to support it, installed the amplifier and did some tests, both by sitting near it as well as a road run to verify the brackets held. Today, I will go through the wiring aspect and fire this thing up. 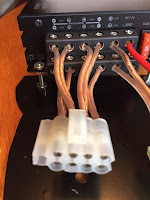 In the last post, I mentioned there are 2 methods for wiring signal to the amp. I used the pre-amp / RCA cables method. To achieve this, I first needed to find and label 6 RCA cables. I found a few old RCA cables from my A/V stash, but they were over a meter (4 feet) long. On each wire, I marked a (F)ront, (R)ear or (S)ub prefix and (Left) or (R)ight. I did this on both ends. Why? So no matter which end I was doing maintenance on (or replacing a component) I knew what the wiring was without having to jiggle wires or unhook the other thing to figure it out. On the amplifier end, I plugged the cables into flat 6-pin pigtails, keeping the F/R/S wires together. 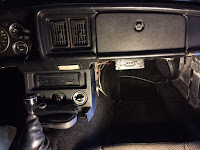 Next, I pulled the stereo out of the center console, and passed the RCA cables through. There are a few wires that need to be removed from the big plug in the back of the stereo, and the rest remain. Simply: all of the speaker wires need to be removed from the plug. Consider, the "signal-on" wire needs to be made available to the amplifier. I had not used it at this point, so I needed to add an extension so it would reach. With the RCA cables plugged into their correct holes in the stereo, the power, switched power, ground and "signal-on" wires connected, the stereo can get put back away. Last, I plugged the 6-pin plugs into their respective slots on the front of the amplifier, noting that "(F)ront" goes to channel 1/2, "(R)ear" goes to channel 3/4 and (S)ub goes to channel 5. There is a 4-pin for the remote bass and "signal on" as well. The remote bass is a knob that I will install later. For now, it is tucked behind the center console near the driver side foot well, but it is wired. The signal on wire I had located was connected to this pigtail and heat-shrinked. To keep things clean, I zip tied the bundle of cables and wire together, and tucked them into protective wire wrap (like this) I picked up at Harbor Freight. The black wrap made the cables disappear. I routed the whole thing up and over the top of the amplifier before routing it behind the center console. This should keep the bundle out of the passenger's feet while still keeping the controls available for fingers. Up until now, the wiring going to the rear of the car had run through the cockpit. I ran the 2 wires along the transmission tunnel on the passenger side. Now that I was adding another pair of wires, though, the cable had become too thick, and was making a lump under the carpet. So, I decided to route the speakers under the car. 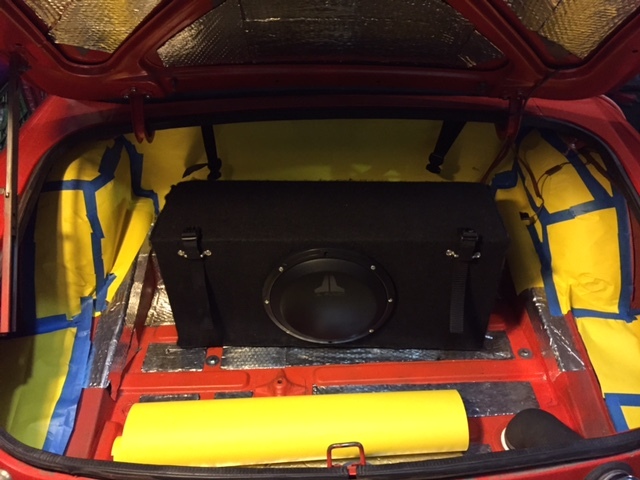 Again, leveraging protective speaker wrap (smaller diameter this time), I routed the wires for the 2 rear speakers plus the sub woofer to the front of the car through a wiring feed hole (mostly hidden by the sub box). 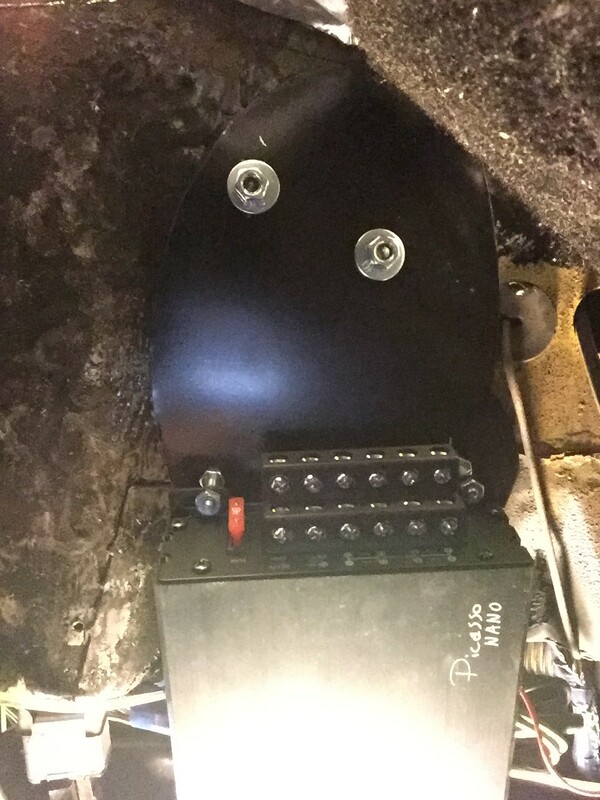 I think it used to control the fuel pump because it has spade connectors in it. From there, the cable ran along the underside of the car with the other bundle of wires that run front-to-back all the way from the fuel pump to the starter. Because of the location of the wiring hole in the trunk, I did not leave much slack in the wires back there. Instead, I considered ways I could get the wire bundle to stay up against the box. I decided to leave the cable wrapped almost all the way to the sub-woofer plug, and figure out how to tidy it more later. With the other ends of the wires for the speaker box hanging under the glove box, I was entering the final phase. Out the back of the amplifier are 12 threaded-bolt wire mounts: +/- for both front (4), +/- for both rear (4), a pair for the sub (2), and one each for ground and power. Since I had done everything else so cleanly, I didn't like the idea of running a bundle of wires at the amplifier. For maintenance and ease of amplifier removal, I wanted something easier. Also, the only slam on this amp in the reviews was about these connections, so I wanted it to be set up once and then forgotten about. So, I got some multi-wire connectors from BritishWiring.com. With these connectors, it would almost look like it was part of the original MGB. Unfortunately, they don't sell any even numbered pins, so I used a 9-pin for the front/rear speakers and a 3-pin for the sub. I wired a few inches of wire from the amplifier to the male plugs (see the second picture from the top) and then wired the speakers and ground/power into the female plugs. That sentence was quick to write, but it took me a several hours of effort. All I had left was the ground and power. I had intended to use the extra pin on the odd-numbered plugs. 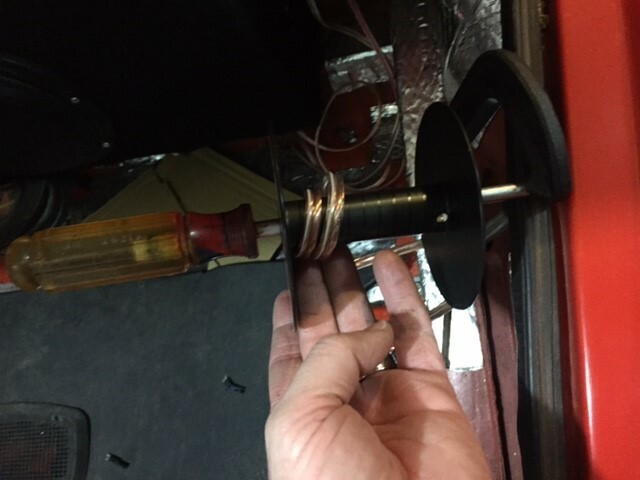 When I set out to do the wiring into the plug (see top picture) I quickly discovered that the 10 gauge power/ground wire needed for the amp were very different animals from the 14 gauge speaker wire I had in the rest of the plug. Quite simply: the 10 gauge was too thick to pin. So, I bought a 3rd 2-pin plug designed for a GM alternator from the local NAPA. It had male and female plugs on it, so I could cut it into two pieces and continue the plan. Similar to the other plugs, I put the male end on the amplifier side and wired the female end into the car. With a ring terminal on the black wire (ground), I leveraged the rear bolt from the amp mount. This was a solid ground, based on my connectivity and voltage tests. 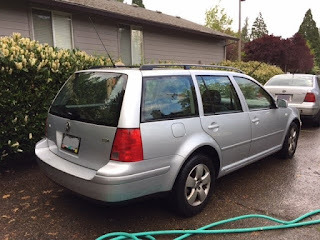 For the power, I ran a blue wire from the alternator, through a 10A bladed fuse and through the rubber-lined wiring hole in the firewall behind the glove box. This dropped the power supply nicely near the amp. Once both were connected through to the plug, I was ready to plug everything in for a test. 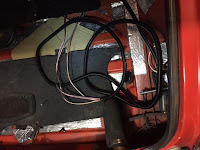 I think, ideally, it would have been better to wire the power into the battery, but the battery is behind the seats, so the wire run would have been longer, creating a greater likelihood of a short. I ran a couple connectivity tests to make sure everything was set to go, and then re-connected the ground on the battery. I had already identified a couple of things that needed to be changed, but with everything hooked up I wanted to see if it worked before I started changing things. So.. in short, the speaker wires were moved from the head to the amp, the amp was wired with power and grounded, and the power-up signal from the head was routed into the amp remote switch. Everything should be set to go. With the battery still connected to a tender, I slapped the face back onto the head unit and turned it on. All the lights came on, but I couldn't hear anything. I turned the stereo way up and could barely hear sound, so I concluded the gains on the amp were too low. Second attempt: turn the stereo back down to single digits and turn up the gains. Now we have sound. With Rush's "Spirit of the Radio" cranking, I set the various levels so Getty Lee's bass snapped and growled, Neil Peart's drums punched and Alex Lifeson's guitar sang. It sounds so good inside the cabin with the top up. Once I get out, the sound really doesn't travel outside of the car as much as I would have expected. Of course, once the top goes down, things will change. This leaves one last test: driving at speed with the top down. That will have to wait until Summer. In the meantime, I tried the classical station for a different sound signal and it sounded really good... but not as good as Rush did. There's just something about Rush. Maybe it's the punchy bass. Whatever it is, the next test will be an early Dead show, like, maybe, the Music Box from Feb 1968, and then a wall-of-sound show. Thanks for following along. I still have to install the passenger seat into Oliver, and then I may start working on the interior door panels. Or, maybe, I'll just finish the trunk. I don't know. I'll see how I feel when I get to the garage. 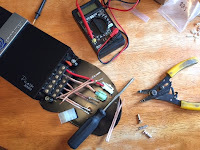 Today's post is about acquiring, and mounting an amplifier to power the speaker box I built over a multiple month period spanning from last summer to this winter. I will get to the wiring and test firing in a subsequent post. While Oliver, the MGB, will probably not quite "Boom" like L'Trimm describe, it will deliver some Phil Bombs. I started down this audio journey for Oliver, the MGB, simply: I wanted sound. I recognized that seeing the little LED screen when I had the top down would be difficult, so I found a stereo suited more for a boat than a car. I figured that a boat had similar issues as a convertible: moisture and glare. I settled on a Sony MEX-M70BT, where the BT stands for BlueTooth. This plays CD's, has a microphone for hands-free phone calls, had 2 USB's for other playthings, etc. Based on the details at Crutchfield (product link here), it has an estimated running wattage of 17 watts with a peak output of 55 watts. 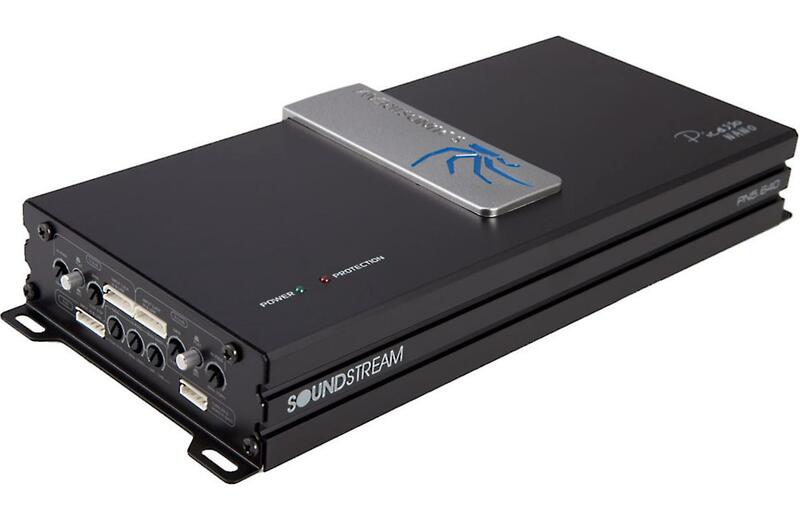 It delivers with pre-amp outputs (at 5 volts) and a bunch of other features that made it slightly better than or on par with the other widely available boat stereos. Car stereos have more features, and usually have greater graphics, but I intend to be driving, so I don't need a light show coming from my dash. I need easily readable print regardless of light level. The simple red or blue back-lit buttons and grey/black main panel fit perfectly with my dressed-down interior. Unlike most of the other boat stereos on the market, there were 0 complaints about product failure. None. That made the decision. For speakers, I had an old set of Polk Audio 6x9's and 6.5" rounds. I don't remember what their peak wattage was, but it's in the 200 watt or more range. Regardless, the stereo was not going to blow them out with a wimpy 17 watts. I installed all of this stuff into Oliver in posts (Get Sound 1 and Get Sound 2), including mounting the 6x9's into the rear firewall and the 6.5 rounds into the foot wells. With little actual testing, I did some research into which frequencies disappear when a convertible top is lowered. Similar to a boat hitting speed, the wind rips the lower frequencies away. I had expected the high frequencies to disappear, thinking that the lower frequencies would be helped regardless by simply resonating against the body of the vehicle. 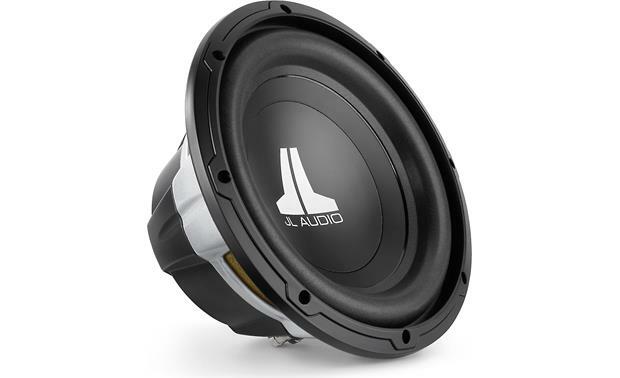 I had even gone so far as to start investigating small 3 inch speakers to boost the upper end when I found that Crutchfield did tests (link here). They proved that the low end falls away. 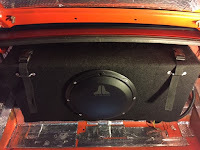 That was when I picked up a JL Audio 10W0V3-4 10 inch sub (details from Crutchfield) to address that. I considered the math at this point. 4 speakers each capable of handling 200 watts plus a sub capable of handing about the same, and I have a stereo pushing out pretty much 17 watts. That did not add up, so I started thinking about an amplifier. Once I made the tiny step into thinking about amplifiers, I discovered just how little I knew about it. Yes, I understood the concept, but the market and distinction between various things is fairly confusing. I considered 2 options: a single channel amplifier just for the sub woofer and a 5-channel amplifier for all of the speakers. The single channel probably would have made more sense for a system that produced more native power. 17 watts just was not going to cut it so I was probably going to need an amplifier for the regular speakers anyway, that is, if I wanted sound that wasn't totally distorted. I found this article which helped justify my thinking and then shifted to which one, what class, etc. Because of the tiny size of the car, I narrowed my choices down to "class D" amplifiers. Between reviews on Azn, Crutchfield and anywhere else I could get reasonable feedback (blogs, Google, etc), I settled on the Picasso Nano PN5.640 (details from Crutchfield). This thing is tiny. It is so tiny, I can fit it inside the cockpit and hide it so the controls are within reach but it is out of sight... unless you look around for it. It sits 12 inches long by 5 inches wide by 2 inches deep (~300 x 125 x 45mm for everyone not in the US). One drawback is that it requires routing wires on both ends. I suppose it made the small footprint possible. Anyway, the inbound signals enters the front panel through 6-pin flat clips: one clip each for front / rear / sub for a total of 3. These clips can be routed through RCA cables to the pre-amp outputs or direct-wired into the speaker wire outputs from a stereo if you don't have a pre-amp. First, I wanted to find a mount location that was near the occupants so the levels could be easily adjusted. Also, I had already run lengths of speaker wire from the radio head unit to the various speakers, so putting the amp near the stereo would reduce the rework there. Last, I had some higher quality RCA cables, but they were each about a meter long so if I could use them I'd save probably $100US just in cabling. Another consideration is human comfort. This car is small. There are not many spare inches available, especially on the driver side, so I went looking on the passenger side. With the seat adjusted so a passenger is reasonably reclined for a drive, with feet mostly extended (slight knee bend for comfort), I found that there was a reasonable amount of space under the glove box. If I crossed my ankles, so one knee was higher, there was still enough space to fit the amp without that knee bumping it. 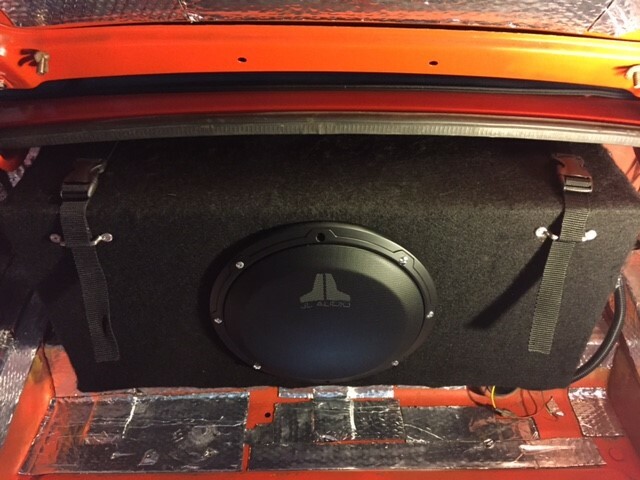 Anything more aggressive might, but this amp only adds a couple of inches... so, I chose to mount it under the glove box, off center towards the transmission tunnel. To hold the end nearest the engine up, I re-used two bolts that pass through from the engine compartment. I test fit with cardboard templates or mocks for the amplifier and then for the supports I needed to make. I found a piece of flashing and shaped it to fit around the oil pressure hard line, fit the 2 bolts from above and have 2 small bolt holes for the "rear" panel of the amplifier. The 2 bolts required (as usual in this car) fine-thread nuts. I grabbed a pair of washers while I was at the hardware store getting that pair of nuts. 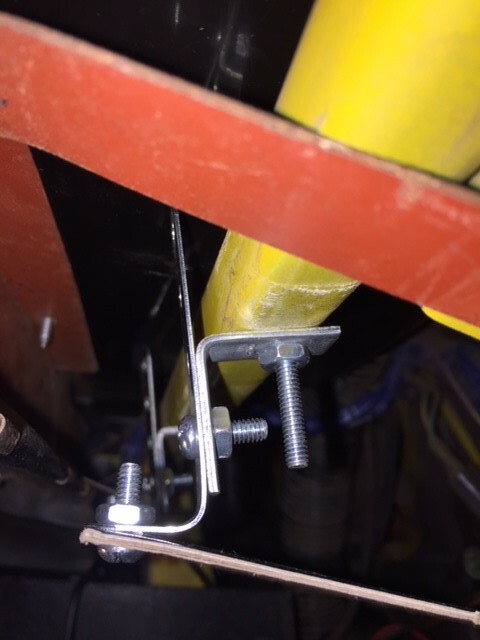 To mount the amp to the support, I threaded a pair of cabinet pull bolts through the support from above and then tightened nuts tightly against it. I passed the bolts through the "rear" slots on the amplifier and passed another pair of nuts onto the bolts. I intend to leave the support attached to the amplifier for any future maintenance, choosing instead to remove the nuts from the re-used engine compartment bolts instead, if I can. They are much easier to get to, and will need to come off when one of those bolts needs to come out for under bonnet service work around the sub-systems they were originally installed to support. Holding the rear end or amp "front" is more of a patch-together solution than I'd intended. I removed the glove box and mapped out a plan that involved strips of steel mounted to the crossbar that runs under the glove box. I guess, ultimately, that is what I built. Reference the picture to the right and above. I started with 2 small angle supports and a pair of steel straps with holes in them. I marked off where I wanted the supports, using the cardboard amplifier model, and then drilled holes through from below. From above, I dropped 2 more cabinet pull bolts, but longer ones. Yes, I do have a lot of those bolts. I threaded on the one-bolt-per-side angles from below and then torqued down a nut per side. I took the 3-inch-long steel straps and bent the last inch 90* and attached one 2-inch end to each angle I had just bolted on. 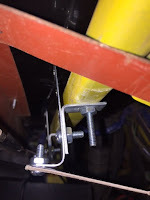 Last, I suspended another (you guessed it) cabinet pull bolt through the one hole in the 1-inch side of the bend strapping. I threaded on a nut and torqued it down. I then threaded on another pair of nuts, and then attached the "front" of the amp before adding a final pair of nuts. Why so many nuts this time? 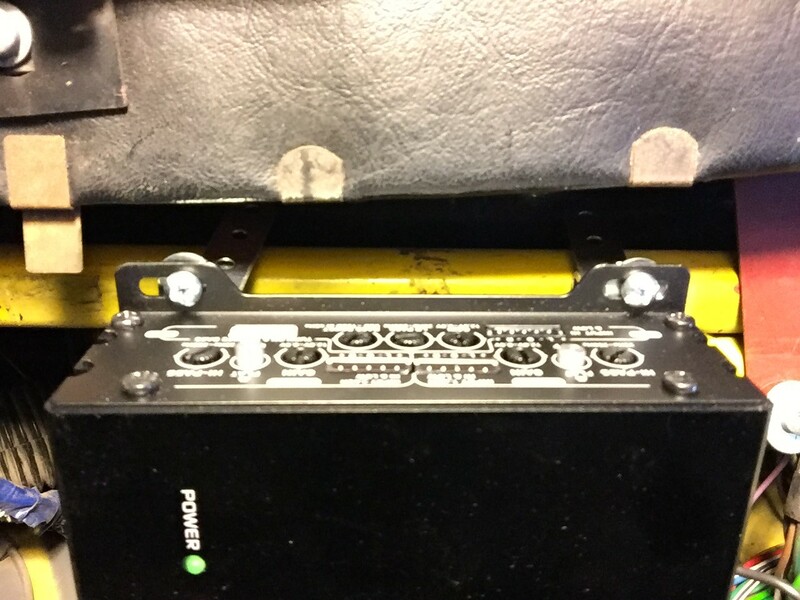 The extra pair of nuts allows for the "front" of the amp to adjust slightly up and down. Any more significant adjustment would be handled by shifting the straps up or down. This combination created a fair amount of adjustment. I left it like this and took a test drive. No, it wasn't hooked up. 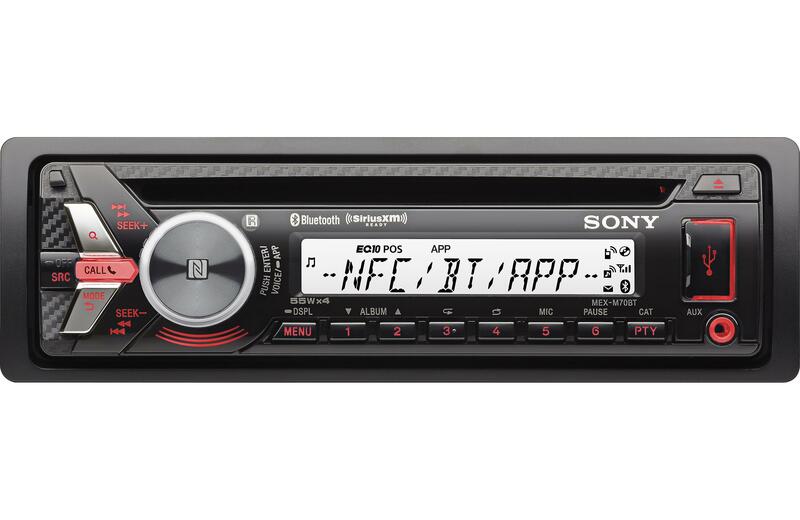 In fact, you can see from the picture to the right that I did not even bother to put the face plate back on the radio. This was the best test I could think of for making sure the amplifier mounting was viable. It held tightly; did not budge at all. Next, I climbed in to see how it felt to a passenger. While I'm not the biggest guy in the room, I am about the same size as my wife, who will be occupying that seat most. So, if it was okay for me, it would be okay for her. Check. Last, I asked Boo to come take a seat. She didn't even notice it until I pointed it out. She had to twist her neck a little bit to make out the knobs, so I think the location is perfect. Of course, there is not room for K2 to put his 40# backpack at his feet, but there really wasn't room for that backpack before. That will just need to ride in the trunk when he rides with me.